A Griffith 600 sports car, fitted with a 4.5 litre (273 cubic inch), V8 engine, as used in the Plymouth saloon, was presented, for the first time, at the 1966 New York Motor Show. It was the last model to be produced by Jack Griffith's company, following the 1965 US dock strike that crippled deliveries of Grifith 400 bodies from TVR in the UK, and subsequently led to the cars demise. Consequently, when TVR now ended production of Grantura bodies for his Griffith 400, due also to the dock strike, he turned to the car makers Carrozzeria Intermeccanica of Turin, Italy. When he saw an Intermeccanica Apollo coupe, he felt he could create a new stylish successor to his Griffith 400 using a steel body and chassis, supplied by them, and with the car assembled by him at his New York facility. The car was built using custom-made bodies, together with components from a variety of manufacturers, such as Fiat, Alfa Romeo, Simca, Peugeot, Ferrari, and Ford. It was designed to be fitted with a Ford engine and drive train. However, due to supply difficulties at Ford, the 273 cubic inch, V8 engine from the new Plymouth Commando saloon was chosen instead. This unit developed 235 bhp, with a top speed of 130 mph, a 0-60 mph time of 6.0 secs, and a standing quarter mile time of 14.7 secs. Sadly, Jack Griffith assembled only a few examples, said to be between 6 and 10, of the Griffith 600 due to dock strike delays in receiving the bodies from Italy, which caused him to simply run out of money, resulting in his company having to cease trading. 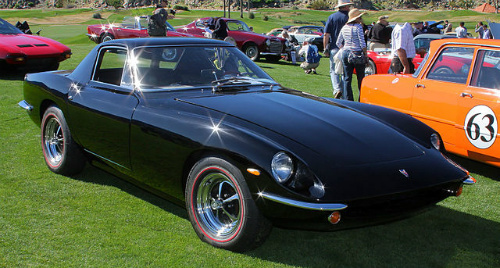 Following this unfortunate episode, Intermeccanica continued production of the 600 sports car for Steve Wilder, who had acquired the rights to the 600, and marketed it under the name of Omega. Powered by a Ford engine, only 33 of the Steve Wilder cars were built and delivered in the US before it was decided production should end in 1967. Consequently, the Triumph distributors in New York reintroduced the 600 under the name GFX, but without much success. By this time, it was felt that the most efficient way to produce the cars was for them to be fully assembled and running when they left the factory in Turin. Following an arrangement set up with an Italian bank, Intermeccanica approached Genser Forman of New Jersey, who agreed to be their US distributor. Following this agreement, production and sales of the car, powered by a Ford V8 unit with Ford running gear, rose to between 100 and 120 units per year. 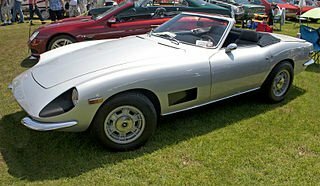 The car was initially called the Intermeccanica Torino, but later changed to the Intermeccanica Italia sports car, which was subsequently produced as a coupe and convertible, the latter version being very successful. Those cars built by Intermeccanica between 1967 and 1972 used, in some cases, the 351 cubic inch Ford Cleveland engine, although most were fitted with the 351 Ford Windsor unit. Cars that were sold in the US were equipped with the same factory air conditioning as used in the Ford Mustang of that period. These cars were fitted with a Ford Top Loader gearbox, and vacuum servo assisted Girling disc brakes all round. Although the designated distributor periodically changed, by 1972, nearly 500 cars were finally built, before production ended.